The temple was originally built in 528 but later abandoned. It was rebuilt in 751 under Gim Daeseong to pacify the spirits of his parents. The rebuilding was only completed in 774 when the temple received its current name Bulguksa. The temple was renovated during the Goryeo Dynasty and the early Joseon Dynasty. During the Japanese invasions between 1592 and 1598, the wooden buildings were burned to the ground. After 1604 reconstruction of Bulguksa started, followed by about 40 renovations until 1805. As with many monasteries, it fell apart during the 19th century due to Korea’s repression of Buddhism. It attracted Japanese scholars’ attention, and the Government General of Chosen conducted a major restoration in 1924. After World War II, it was again left neglected for two decades. A partial restoration was conducted in 1966, and by the formal restoration between 1969 and 1973 under President Park Chung Hee, Bulguksa was restored to its current form. The temple is considered as a masterpiece of the golden age of Buddhist art in the Silla kingdom. Bulguksa is sometimes referred to as the Temple of the Buddha Land. It is home to many national treasures. 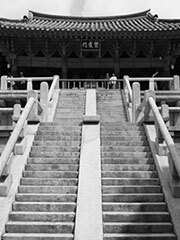 The entrance to the temple, Sokgyemun, has a double-sectioned staircase and bridge (National Treasure No. 23) that leads to the inside of the temple compound. The stairway is 33 steps high, corresponding to the 33 steps to enlightenment. The lower portion, Cheongungyo (Blue Cloud Bridge) is 6.3 meters long and has 17 steps. The upper portion, Baegungyo (White Cloud Bridge) is 5.4 meters and has 16 steps. The stairway leads to Jahamun (Mauve Mist Gate). There are two pagodas on the temple site, which is unusual. The three-story Seokgatap (Sakyamuni Pagoda) which stands at 8.2 meters is a traditional Korean-style stone pagoda with simple lines and minimal detailing. Seokgatap is over 13 centuries old. Dabotap (Many Treasure Pagoda) is 10.4 meters tall and dedicated to the Many Treasures Buddha mentioned in the Lotus Sutra. In contrast to Seokgatap, Dabotap is known for its highly ornate structure. Its image is reproduced on the South Korean 10 won coin. Dabotap and Seokgatap are Korean National Treasures nos. 20 and 21, respectively. The terrestrial and the two celestial abodes are manifested in Bulguksa: the terrestrial with a Shakyamuni Buddha Lotus Sutra, the celestial with Amitabha Buddha Avatamska Sutra. The large temple site is centred around two courts. One of the courts is centred on Daeungjeon, the hall which houses the Shakyamuni Buddha. The other is centred on Geungnakjeon, the hall of paradise where the Seven Treasure Bridge Chilbogyo is housed. In 1995 Bulguksa was added to the UNESCO World Heritage list together with the Seokguram Grotto.